How long since you passed a sad traffic accident? Consider this: A person is 10 times safer taking public transportation for a commute than driving. You are 90% safer if you take public transportation (for commutes). The finding comes from a new study by the American Public Transportation Association (APTA). 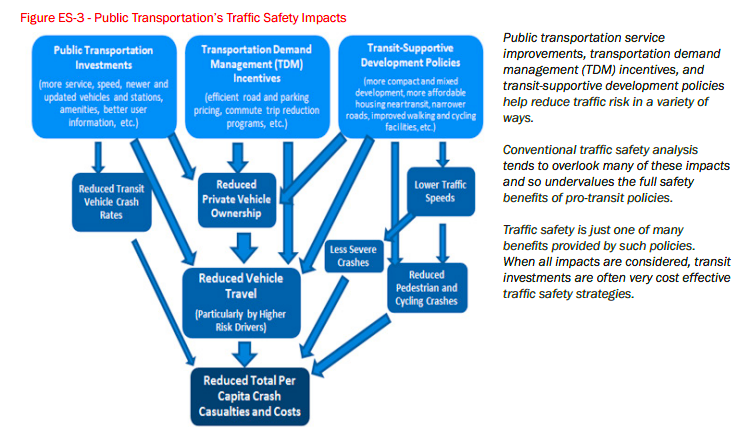 The study, The Hidden Traffic Safety Solution: Public Transportation, builds on many other such studies. Communities that use mass transit enjoy less tragedy. They have about 20% the per capita traffic casualty rate (fatalities and injuries) compared to communities primarily using automobiles. People who do not use public transit still benefit, of course. Crash risk is cut in half with more public transit, with fewer auto miles traveled and safer speeds in such communities, according to the findings. Todd Litman, director of the Vitoria Transportation Policy Institute and a contributor to the report, notes recent data released by the US Department of Transportation: 35,092 fatalities as a result of auto accidents in 2015, an increase of 7.2% from 2014, which was the largest increase since 1966. According to the U.S. Department of Transportation, there were 35,092 fatalities as a result of auto crashes in 2015. That is an increase of 7.2 percent from 2014, the greatest increase in deaths in 50 years. Public transportation is a safer way to travel than auto for an individual. simply by taking public transit as oppose to commuting by car. 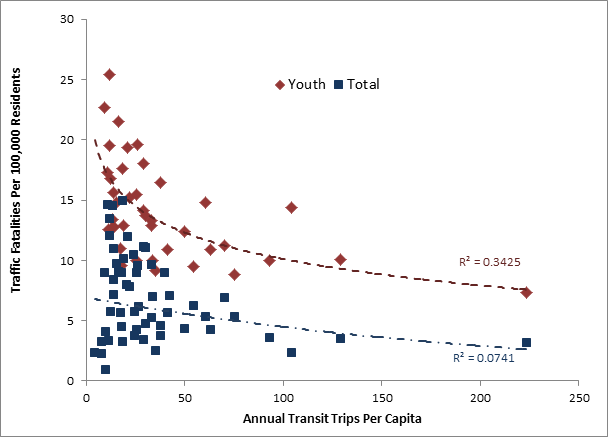 Traveling by public transportation is ten times safer per mile than traveling by auto. Transit-oriented communities are safer than automobile-oriented communities. traffic safety casualty rate (fatalities and injuries) as automobile-oriented communities. average traffic fatality rates as cities where residents average fewer than 20 annual trips. about 1.5 percent up to about 4 percent. Public transportation can help address high-risk and vulnerable driver groups. implemented in conjunction with public transit improvements. much and have about half the per capita auto death rate. Appreciation to Todd Litman, APTA, and all contributors for this life-saving information. Remember to vote for funding for quality public transportation in November. Get out, walk, travel by train, bicycle, and take the bus. Enjoy the sights from outside of a car.